I was reminded recently of the power of gathering a Circle of Influence around you from an email I got a lovely soul in my networking circle, Amanda Goldston. On my desk, I then spotted the book by author Kuumba Nia called The Circle of One. Then I had a conversation about collaborating with a circle of complementary archetypes with Lillian Ogbogoh. When you get messages in threes, it’s time to pay attention !!! As I am now entering a new phase in my life and career as a speaker and author. I thought it would be handy to garner together as much support around me as possible. So I had a musing on a dog walk on which people and souls, both living and departed, I would treasure having around me over the coming months and years. I’ve come down to a short list of seven of them whose wisdom, experience and achievements I admire greatly. I will be checking in with them regularly in meditation and while talking about existing books and creating the next ones. For the three that are still living, I would dearly like to connect with them by electronic means and ideally meet them in person one day. My thinking is that achieving just 1% of what one of them had done individually would be a fabulous goal in itself. Where this might lead when some of their guidance rubs of collectively, God only knows. I thought too it would be fun to run a competition based on my Circle. I’ve now augmented my book Flavours of Thought: Recipes for Fresh Thinking into a Second Edition with loads of new recipes and some more insights. It will be available in print and as an ebook by Autumn. 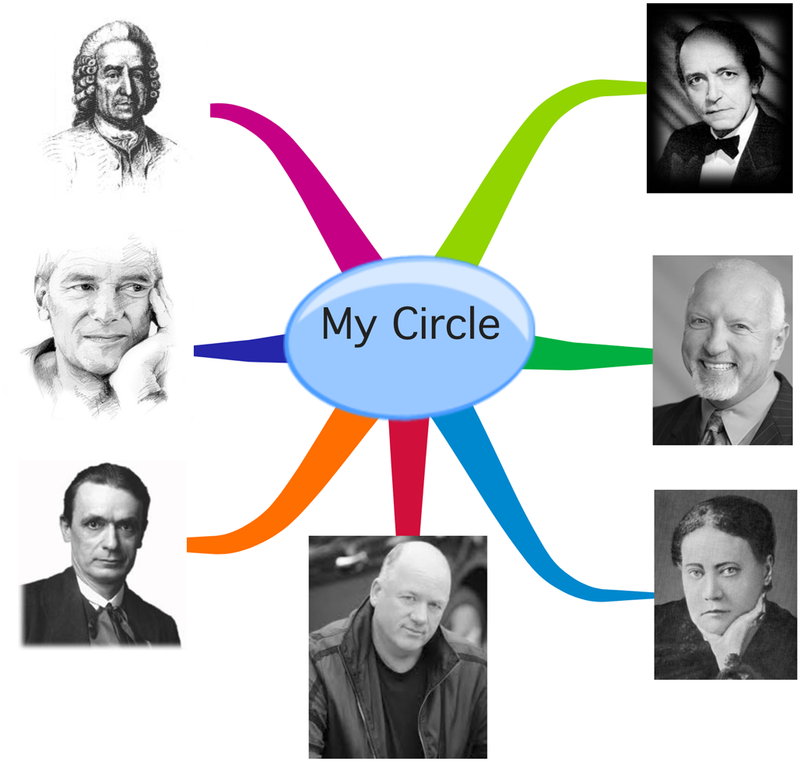 I will send a pre-release copy of the ebook version to the first person to identify all the seven people in my virtual Circle correctly. Here’s my Circle below – click on the image to see a higher resolution version. So Good Luck and why not have a go at assembling your Circle of Influence too?